able to leap tall sandwiches in a single bound! Is it an eggplant? A meatball? He's the one monster that is loved by all (especially me!!). His different characters in Sesame Street makes him a funny and jovial creature. One minute he's the blue man's waiter, another moment he turns into SUPER GROVER! who comes to save the world. I just love it when he irritates the blue man by mistaking his orders for a hamburger or whatsoever. Grover just simply cannot finish listening to orders before rushing off to make his delivery. Hmphfff! Mmphff! He's so funny! Grover and friends are out camping! Look! There's Grover's mum! Grover posing for his photo shoot! Grover saving a damsel in distress! 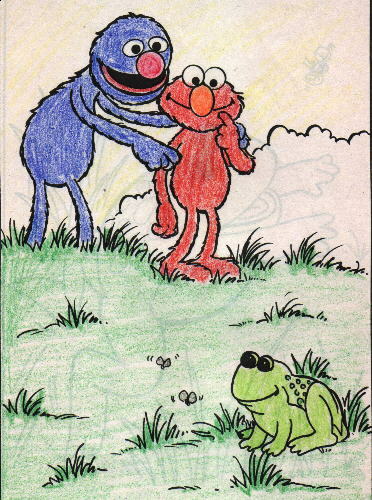 Grover and Elmo on a nature trail. Look! They've spotted a frog! 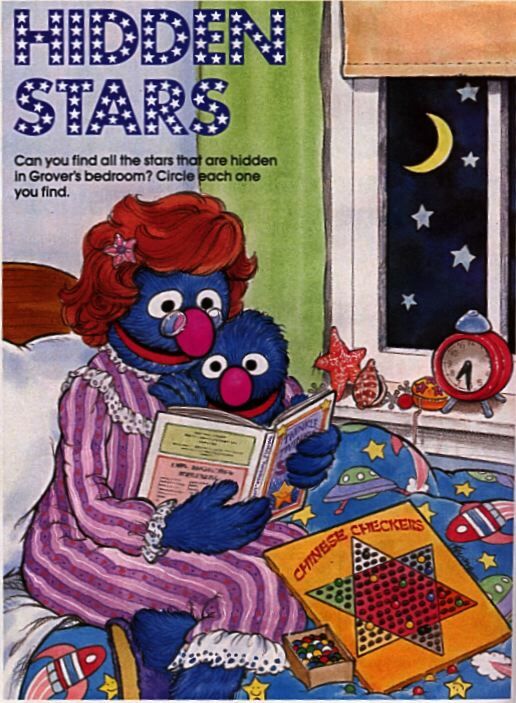 What's that board game Grover's playing? Disco Grover twists and shakes! Go go Grover!! Grover having a fun time in the sandbox! Here's a game to play with Grover! Top 10 little ways to save the Earth! Do you have any great idea to save the world in your own little way? Email me to give me your ideas! Remember to include your name, age, email and country!